Brunch Bird: Oh, The Onion and The Politico Are Coming to the D.C. Media Scene? Yawn...Because So is JESUS! Oh, The Onion and The Politico Are Coming to the D.C. Media Scene? Yawn...Because So is JESUS! * Gavin and Dufour have lost perspective on the work they're doing over there. * New circulation strategy: You weren't planning on picking up our paper, huh? Well enjoy burning in hell. 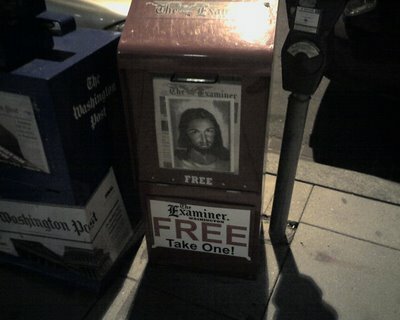 * New motto: Jesus Saves...50 cents by reading The Examiner! If anyone can save that town from itself, it's the Son of Man. Plus, since he turns water to wine, he should be welcomed with open arms to the next one of your parties, Bird. If a xeroxed picture slid into the front of the box can fool you, I'm going to have a lot of fun rigging fake headlines into your local WaPo box. OH MY GOSH ANONYMOUS, THAT'S JUST A XEROXED PICTURE SLID IN THE FRONT OF THE BOX?! I HAD NO IDEA! OK, all other commenters, don't worry. Anonymous has helpfully pointed out that we're all stupid and that that's not really the front of The Examiner. Phew. Anon's sample WaPo headline: "The Real Newspaper Is Behind This Piece of Paper." Yeah, SC, and then it would be the Times behind it...sweet. Fake but not fake headline. Yes, BB, I assumed that as you stood two feet away from the machine that you knew what it was. Phew indeed. General rule of comedy: if you have to explain the joke, it's not funny. I'm fairly sure the commenter is the Rev. Moon himself. He's the only one who would even joke to say that the Washington Times is the "real newspaper." It's the only logical solution. Stop this bickering or I'll condemn you all to Hades.